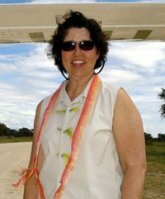 This Namibia travel review was written by one of our previous USA guests, Nancy Morris. Here she shares with us her thoughts, experiences and recommendations on traveling to and hunting in Namibia, Africa. The purpose of this article is to give some insight to anyone who dreams of such a trip to Africa (and especially Namibia) and to answer FAQ. These recommendations are very useful since they are from a visitor's point of view. "Until we experienced it, we had no idea of the distances between settlements of people in Namibia. It is what I term splendid isolation. It is hard to put into words what we felt  trying to relate it to something we were familiar with in the States  we think the experience was to a degree what it must have been like for the early pioneers in America. We saw people in Namibia who were very self-sufficient and at peace with the land yet aware of their surroundings and the potential risks and hazards they faced. Splendid isolation ... never could we have imagined the beauty that awaited us in the Kalahari... the land, the animals, the people! Our stay at Uitspan Ranch was magical! The Duvenhages were such gracious hosts  so willing to share their knowledge of and love for the Kalahari and to welcome us into their home. The hunts and game drives were incredible. Our lodging had all the comforts of home and included a breathtaking view of Botswana from the veranda. It was a wonderful adventure that truly enriched our lives. What we experienced during our stay on Uitspan Hunting Ranch, was a family content with its life in the Kalahari, truly at peace with the land, and a family of great faith. We all got to experience a brief moment of that peace and contentness while we were at Uitspan. You shared with us an amazing gift. Thank you! We simply could not believe the abundance, variety and quality of animals we saw. Being able to approach the animals so closely on game drives was also an unbelievable experience. 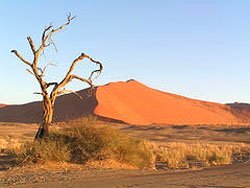 Namibia is generally not well known or known of at all in the U.S. Most Americans including us, know of Africa mainly as South Africa. This is due mainly to the vast amount of publicity SA received because of apartheid. That view for many years was not a positive one. Other sources of information on Africa were from movies which can sometimes be exaggerated or idealized  these run the range from Out of Africa to Blackhawk Down to Hotel Rwanda. There has been more recognition of Namibia because of movie stars Angelina Jolie and Brad Pitt choosing Namibia and in particular Swakopmund as the place to have their baby. Privacy laws are much stricter in Namibia than they are in the U.S. or other parts of the world, so these high profile movie stars chose Namibia as a way to get away from the media. Even more recently the Kalahari is becoming more well known because of a television show called Meerkat Manor, which is aired on the Animal Planet channel. The show has become incredibly popular in the States. I have two friends that had traveled to Namibia that I consulted before our trip. Both had been parts of organized scenic tours and neither had any interest in hunting. They were helpful with ideas on sites to see in Namibia. Additionally, I looked for information on Namibia on the internet, read travel brochures from tour companies and purchased travel books from Amazon.com." Namibia was way beyond any of our expectations. The diverse natural beauty of the country, its vastness, the magnificent animals, and the wonderful warmth of all the people we met in Namibia was far above anything we had imagined. 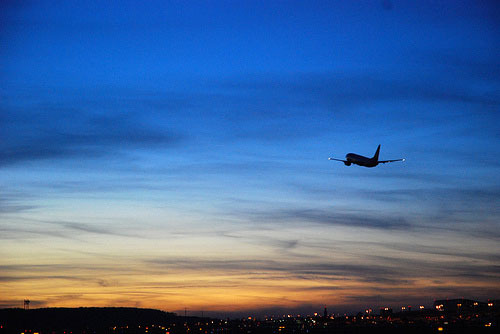 Considering the distances that are covered, the airfares while high did not surprise me. Our airfares were U$1300 per person for coach class  of course we had some extra stops along the way and spent time in SA after the trip to Namibia. Making the airline bookings probably took me the longest and was the most frustrating an stressful part of the pre-trip planning. Check with health department at least six months before departure to determine what inoculations and vaccines are necessary. Medical evacuation insurance  consult with your medical insurance provider about health insurance coverage for international travel. Both our insurance providers recommended we get emergency medical evacuation insurance. We used Med-jet Assist and my in-laws policies were through Travel Guard. This type of insurance is readily available and reasonable in price for people under age 70. It was a little more difficult to find companies that would insure Dad because he was 75  but once I found Travel Guard, while a little more expensive, it was still reasonable. Check with airlines well in advance of travel for restrictions on transporting weapons and ammunition. Each airline needs to be consulted regarding its policies. It is particularly important to plan ahead if you plan to make stopovers as we did on our way to and from Namibia. Some countries may require prior approval before weapons or ammunition may enter the country. Checking with the countrys embassy location in the U.S. is the best first step. Pack converters for electrical appliances. Packing for the trip: Emphasis should be on packing light. We could have packed many fewer clothes, since the laundry (really) get done every second or third day. The Kalahari reminded me of the high desert of Utah and Arizona, warm days and nights that cool off quickly once the sun goes down. Our lightweight fleece jackets were great for these temperature changes. Zip off pants, light weight t-shirts, and light weight long sleeve shirts plus a very good hat and a comfortable pair of boots are about all that is needed. Communication: Since most everyone in Namibia can speak English this is a great positive for Americans considering travel there. Food: We did not really know what to expect, but found food styles very similar to the States or what you would find in Germany. The exception being we were able to enjoy local game (kudu, gemsbok, springbok, etc.) in place of beef, pork and chicken which we normally eat. 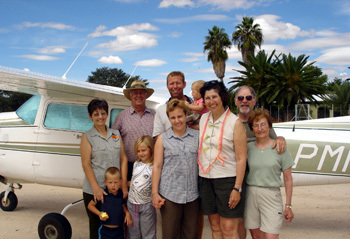 Consider a photo-scenic safari: Clearly what made our trip a tremendous success was traveling around Namibia by private plane. We got to see so much more of the country going by air. While this was more expensive, if was well worth it! " Daily costs per person - very reasonable for an all inclusive trip. The PHs amazed us with their knowledge of and respect for the animals, tracking abilities, hunting skills and focus on safety, and their dedication to maintaining the environment. 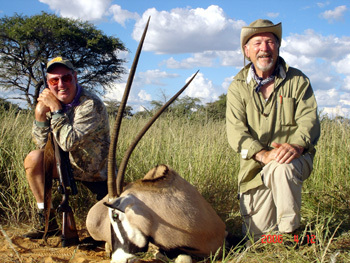 My husband, father-in-law and I had all been with other hunting/fishing guides before in the states and Canada, however none has ever come close to the level of knowledge and professionalism we experienced in Namibia  especially with Kobus and Michael  we were all very impressed! Nancy is the former Vice President of New Business Growth, The Dow Chemical Company. She worked for the company for 29 years and retired in 2005. Nancy, thank you for the time spent on the thorough notes. This Namibia travel review will be helpful to a lot of travelers! 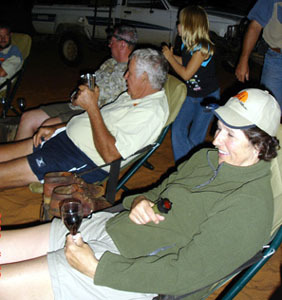 Nancy and her family came to hunt on Uitspan Ranch with Kobus Honniball.